So, yesterday was the first of two committee stage debates on the EU Referendum Bill, the next being on Thursday (tomorrow). Eagerly anticipated was Amendment 11, tabled by Bill Cash, Owen Paterson and others, seeking to restore Section 125 of the Political Parties, Elections and Referendums Act 2000, which the Government seeks to remove by Clause 25 of Schedule 1 of the Bill. After overnight wheeler-dealing, it was anticipated that Labour would support its own Act, which was being shredded by the new Conservative Government. With the support of the SNP, and as many as 40 Tory rebels, this would have proved sufficient to have wiped out Mr Cameron’s slender majority and deliver him his first defeat of the Parliament. First out of the traps was Alex Salmond, but his main concern was to grandstand on a “double-lock” for the referendum, tabling an amendment which would require a majority in Scotland and the other component parts of the UK, before we have a valid “no” vote. If there is a difference in the vote, Scotland could split from the UK. An interesting facet of his position was that he argued that Scotland was a nation. In EU terms, though, it is regarded merely as a region. The Scottish region should, perhaps, be wary about making it more difficult to leave this destroyer of nations. 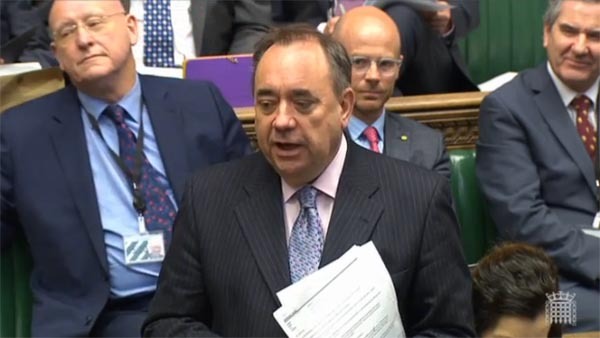 Speaking on the abolition of purdah, Salmond declared his SNP group united in support of the European Union. But they were not prepared to accept a biased referendum. If the issue of purdah was “correct”, then it must pertain to the referendum as well, he said. And civil service impartiality must be maintained. Going even further, Salmond suggested that there should be rules produced by the House on the implementation of Purdah, and a “fairness committee” comprising Privy Councillors, with penalties for breach of the rules. Liam Fox spoke next, one of the “old gang” of Tory eurosceptics. It was, he said, unacceptable for government to exempt itself from rules of procedures. The reason we had purdah was to prevent the government from using resources to support one side of the debate, potentially altering the course of the debate. After any referendum, particularly one that, as we know from previous debates on Europe, will arouse great passions on both sides, he said, we require the result to be regarded as fair, reasonable and legitimate if there was to be any chance of the country coming together on the issue once the voters had spoken. If people believed that they have been bounced or that the result is the consequence of a rigged process, Fox added, it would be extremely difficult for the country to come together, and the political consequences would be intense. It must be seen that the legitimacy of the process is related to the fairness of the process. That was what was being put at risk by the Government’s proposals. Meanwhile, euro-trash Peter Wilding had been in the Telegraph, sneering at the “Europhobes” and talking of Owen Paterson, who had “oozed indignation on Sunday”. Purdah, said Wilding, was a red herring. During the election, the Conservative Party campaigned on the basis of a manifesto that included the pledge to hold an in/out EU referendum. It is hardly reasonable, now that the Conservatives are in government, that they should not be able to take a stance on the issue. One does not, of course, expect euro-trash to have any understanding of constitutional niceties, but the only “red herring” was his. Purdah does not stop ministers, or David Cameron, expressing a view. They are simply not allowed to campaign on the issue, using government resources and public money. As far as this blog goes, anyone who uses the term “europhobe” is out of order. The term begets “euro-trash”, although we’re equally at home with “euro-slime” or even “euro-filth”. Already noted, by Salmond and others – recorded by the BBC – was a “concession” made by the Government that a 5 May date in the next year has been dropped. This really was the red herring. There never had been chance that this was going to be the referendum date. So the Government has committed to not doing something it never had any intention of doing. This had arisen from Government assurances sent by e-mail overnight to Conservative MPs by Europe Minister David Lidington. But as well offering his “non-concession” on the date, he reminded colleagues of the second reading debate, when Foreign Secretary Hammond had promised that Government “will exercise proper restraint to ensure a balanced debate during the campaign”. Now Lidington promised to “work with colleagues over the next few months to understand their specific areas of concern” and then “bring forward at report stage in the Autumn government amendments that command the widest possible support within the House”. This, he said, would “put beyond any doubt that the campaign will be conducted throughout in a manner that all sides will see as fair”. While there had been some confidence that the rebels would carry the vote on the amendment, this was beginning to dissipate. Europhile Dominic Grieve, former Attorney General, had been expected to oppose the removal of purdah, as a matter of principle – as he made clear to the House in an intervention. However, on hearing assurances from the Minister that the Government would reconsider purdah and return at the report stage with a proper amendment, Grieve declared he “would be quite prepared to continue to give them my confidence in this matter”. In his experience in the House, it was “quite frequent in Committee for a Bill to be criticised, for the Government to give assurances that they will remedy it”. MPs frequently accepted those assurances. “That is why”, he concluded, “I have no difficulty in proceeding along the usual established route”. As if we needed reminding of the importance of the issue, we could read that only 15 percent of Conservative party members would vote to leave the EU irrespective of any negotiations. Some 63.3 percent would cast their vote according to the outcome of the negotiations, so the way the details are handled would be crucial. Nevertheless, the writing was on the wall for the rebellion, with the death knell sounding as it emerged that Labour would not support the rebel amendment. Instead, it was tabling one of its own which did not seek to reinstate purdah. It simply asked for more “clarity” about what the Government had in mind. Veteran eurosceptic, Bill Cash, stepped in – fresh from hospital and unable to stand for any length – making a heroic attempt to save the day for the rebels. He offered a means of retrieving the situation so that there didn’t have to be a vote. It’s about trust, said Cash, but not just about trust. Purdah had been put in for very sound reasons, so he appealed to the government to think again. The people had a right to know that the referendum won’t be “canted”. This is not a eurosceptic argument – the real question is about our democracy. In response, we got an ignorant intervention from Clarke, muddying the water. He deliberately overstated the adverse impact of Purdah, but was called to order. Cash cited the Electoral Commission in support. Labour europhile Mike Gapes then did his muddying, dribbling about Norway and Switzerland, arguing that they have to obey all the rules with no say. He was called to order, for straying too far from the amendment, but managed to waste time in the process. Kenneth Clarke then held forth, with what was described as a “Hush Puppy” approach, sneering about purdah. People are suggesting that the whole government machine should be switched off for four weeks, he claimed. This was pure hyperbole – it is a deliberate misstatement, typical of the euro-trash approach to politics. The government is unaffected. Simply, ministers cannot actively campaign for the proposition, using public money. Insultingly, the wrecker Clarke even got the Section wrong, citing S.129 instead of S.125. That illustrated his contempt for the efforts of the rebels. But his “casual wafting around” was noted by Richard Bacon. It sounded like and most certainly was filibustering. Lidington then took the stage, defending purdah – it would be unworkable, he said. Bill Cash challenges his view, but Lidington stood his ground. The Government seriously wants this removed. He said the Government’s job was not to supplant the “yes” campaign, but claimed that the Government must be able to feed information into the debate. Changes would be be introduced at the report stage, he affirmed. We’re not going to ask the House to accept our word. The Europe Minister then announced that the report stage would not be until the autumn. That means that, by the time it goes through the Lords, the Bill is going to struggle to get Royal Assent by the end of the year. But to those willing to accept the good faith of the Government, it also signalled that it was taking the prospect of amendments seriously. And with a weak chair and Clarke boring on, chewing up the time allocated for the debate, many who wanted to speak were not called. The rebellion was collapsing. The decider, though, was Labour. It had bottled out and abandoned its own legislation, planning to abstain in the crucial vote. When it came. this gave the Government a victory of 288 votes to 97 – a majority of 191, with only 25 rebels to the fore. However, the battle is not over. The showdown has merely been postponed to the autumn and the report stage. Grieve warned of stormy waters to come, saying that if the Government were using the promise of amendments to “try to wriggle out of this obligation again”, he “would regard that as a rather infamous thing to do”, and would not support them. Thus we see battle deferred rather than won or lost – just an opening skirmish in a long war. And at least more of the public are aware of the issues. For many, there is a whiff of Government manipulation. Trust, it could be said, is not at an all-time high.